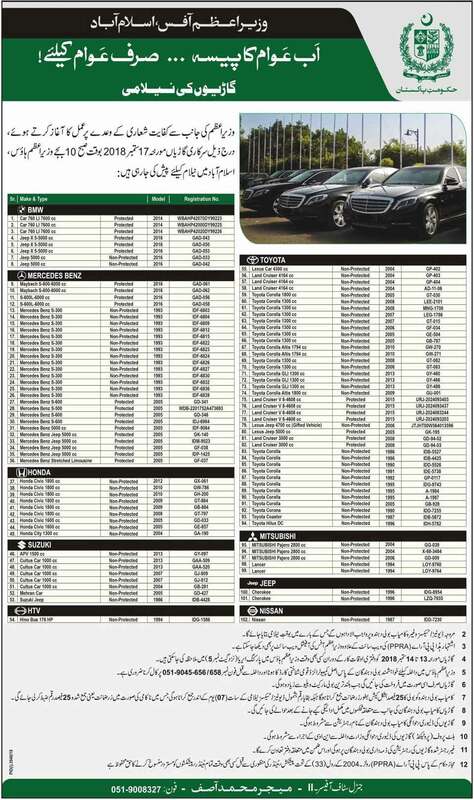 In a fulfilment of a promise made by Prime Minister Imran Khan, the auction of 102 luxury vehicles is being held today at the PM House. It is pertinent to mention that 27 luxury vehicles are bulletproof. Earlier on September 1, the federal government decided to immediately put a fleet of government cars for auction following the premier’s austerity policy. Sources mentioned that the government collectively sent 33 vehicles out on auction advertisement to reduce public expenditure from the government’s end. The elite auction is carrying eight luxury BMW cars and four recent models of Mercedes Benz vehicles in its ad including 16 Toyota Corolla, three Suzuki cars and one HTV vehicle.